Now for those enjoy an adult beverage every now and then like cognac, we know how rich and mesmerizing the color is while swirling it around in the glass. When it comes to color, cognac has become a big favorite quickly when it comes to dress suits like this 3 piece suit by Vinci. 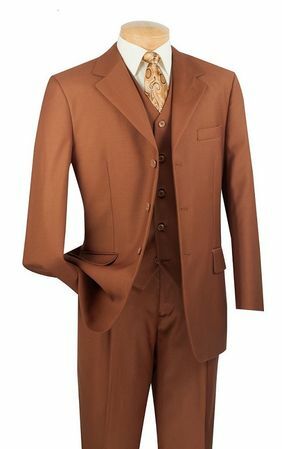 Just watch how good you look once you try on this solid cognac color 3 piece suit featuring a single breasted 3 button jacket with notched lapels and side vents, matching vest and double pleated baggy pants that are lined to the knee and ready to be hemmed by your tailor for a custom fit. Get a 3 Piece Suit Here.